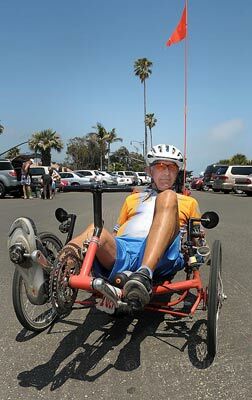 Bert Shaw, on his three-wheeler recumbent bike, did this year's AIDS/LifeCycle ride for the fifth time. During months of physical therapy, Shaw said, “I came to understand what training can do.” He found himself a new bike-a three-wheeler that he can ride in the easy-on-the-back recumbent position-and then he found himself a challenge. He signed up for the AIDS/LifeCycle, a week-long, 545-mile ride from San Francisco to Los Angeles. It was in June 2003, a year after his crash. Even though the hills made it difficult-the 81 different gear combinations on his bike came in handy-Shaw appreciated the scenery, especially on the sixth day, when the ride came through Santa Barbara. He spent most of his adult life here, moving three years ago to Jacksonville, Florida, where his partner Shirley Werner‘s daughter was ill. He joined the North Florida Bicycle Club. “I ride up to 200 miles a week,” Shaw said. “But it’s flat. Really flat.” He figures his bike has 21,000 miles on it. There was even an 80-year-old guy pumping away at a tricycle six years after he broke his back. 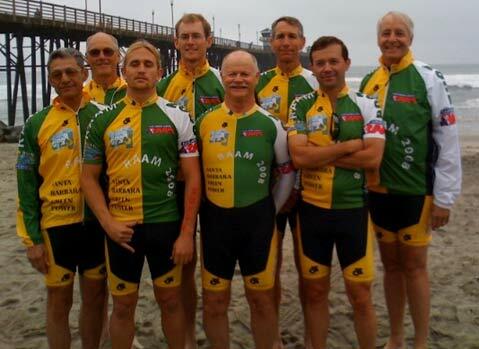 RAAM RIDERS: Santa Barbara Green Power, a team of rabid cycling enthusiasts, completed the 3,000-mile Race Across America (RAAM) this month in six days and 17 hours-an average speed of 18.71 mph. Their leader was Dr. Don Flanigan, who turns 70 this year. His stepson, Shaw Talley, was the youngest at 30. Others were Ed Allbritton, 67; George Bifano, 66; Brian Knowles, 61; Mark Luke, 50; Paolo Ciani, 45; and Steve Knowles, 31. They finished seventh in the eight-man division. It was Flanigan’s third time in the race, and the fastest he’s ever made it from coast to coast (Oceanside to Annapolis, Maryland). The riders took turns relay-style through night and day-including a day that looked like night when lightning-spitting black clouds, with tornados in the vicinity, descended on them in Missouri. 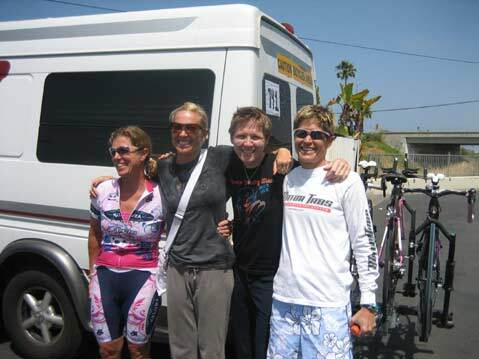 Four other hometown riders comprising the Kalyra Women’s Racing Team-Jill Gass, Lisa Tonello, Sonia Ross, and Dotsie Bausch-competed in the sprint race from Oceanside to Flagstaff, Arizona. They covered the 491 miles through mountains and desert in 26 hours and 34 minutes. It was a prep race for the team, which intends to go after the women’s record for the entire RAAM next year.